Forest City Fashionista: O Canada!! I am fortunate to live in a city with many parks and green spaces. I work on a university campus that features many different types of trees and flowers, and in the summer it's a beautiful place to take a lunchtime stroll. The tree on the left with the drooping white blossoms is just outside the building where I work, as is the bush with the flowers in the bottom right photo. 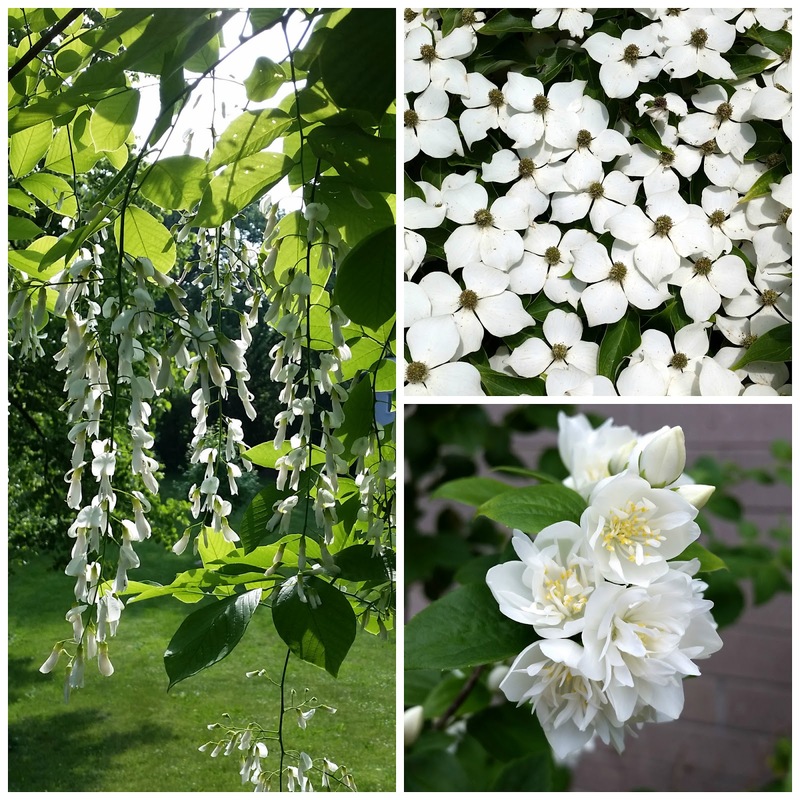 The flowering tree in the upper right photo is some type of Dogwood and this was the first year I noticed it had exploded with blooms. In addition to the variety of flora, we also have an entertaining selection of fauna on campus. We have at least two groundhogs who make their home near our building, and a few years ago I managed to get a photo of a litter of groundhog babies. Like most critters, they are adorable when they are small, before they get their giant yellow teeth. 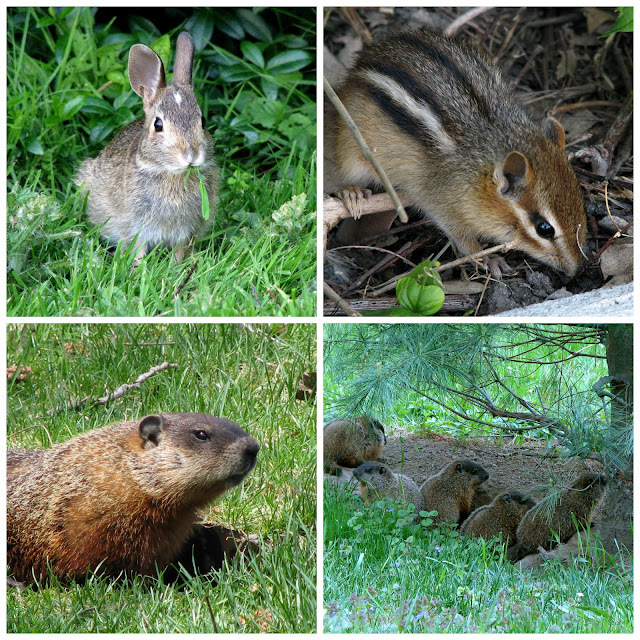 I have also spotted the occasional rabbit, and a few chipmunks, which are my personal favourite - I've wanted to pop one in my pocket to bring back to the office as a pet. We are also visited by raccoons and deer. I am proud to live in a country that supports equal rights for gays and lesbians, and while the recent Supreme Court decision in the United States is definitely a cause for celebration, it's worth noting that Canada legalized gay marriage 10 years ago! This past weekend was the annual Gay Pride Celebration in Toronto, Ontario and the city was awash with rainbows (and a whole lot of rain, unfortunately). 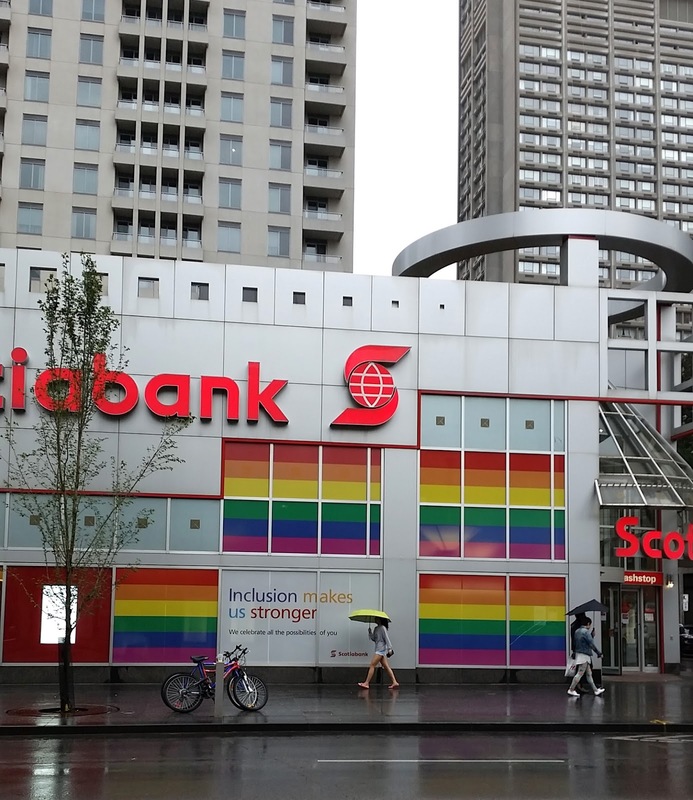 The ten day festival is the largest Pride celebration in Canada, and one of the largest in the world. As a single woman, I am able to travel in Canada unaccompanied without the fear of being attacked or harrassed, which is a privilege many women in other countries do not have. I travel alone often, and am fortunate to live close enough to Toronto to be able to enjoy the city's many art galleries, museums, and other arts and culture events. On my most recent visit, it rained cats and dogs all day, so I took refuge in the Bata Shoe Museum for a couple of hours. 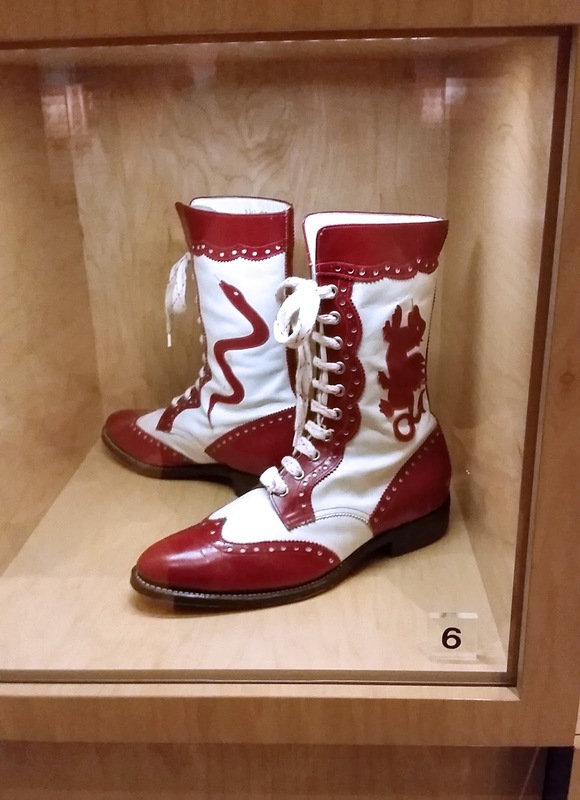 The museum celebrates the history of footwear and has approximately 1,000 pairs of shoes on display at any one time. In addition to the main gallery which showcases footwear through the ages, special themed exhibits occupy three other galleries. My favourite pair of shoes in the "History of Footwear" gallery are these beautiful Bolivian dancing boots from 1950. They could easily be worn today with their stylish "spectator" design. 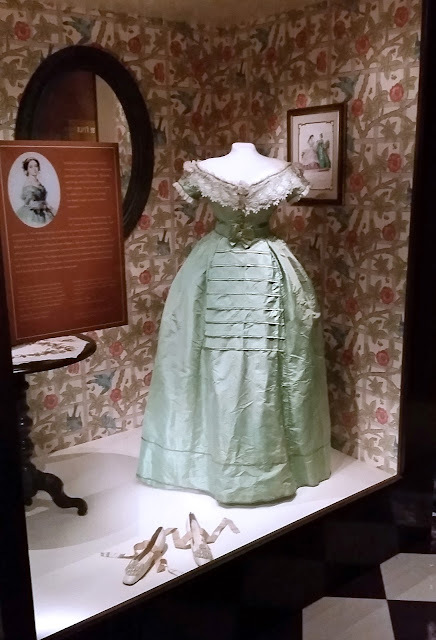 One of the current special exhibits was titled "Fashion Victims - The Pleasures and Perils of Dress in the 19th Century" which contrasted the beauty of the clothing and accessories that were available to the wealthy of that time period with the dangers posed by clothing containing arsenic-based dyes (the dress in the photo above was coloured using such a dye) and impossibly narrow footwear that constricted and deformed the feet. I was in Toronto to see a performance that was part of Luminato, an annual celebration of the arts that began in 2007. Since Jorn Weisbrodt (aka Rufus Wainwright's husband) took the helm as Artistic Director in 2012, the festival offerings have shifted from events aimed towards the mainstream masses, to a more balanced selection that includes creative experiences designed to challenge audiences to think about what Art is, and its purpose in society. Apocalypsis, which was performed at the Sony Centre, was such an event - a musical theatre spectacle composed by R. Murray Schafer in the late 1970's, and performed only once, in 1980. The piece is based on the Book of Revelation; Part one depicts the end of the world, and Part two, a renewal of life, and hope. This version featured approximately 1,000 performers (800 of them members of choirs from all over Ontario) including actor Brent Carver, dancer Denise Fujiwara, throat singer Tanya Tagaq, and the voice of Laurie Anderson. It was an extravaganza that was at times mystifying, mesmerizing, discordant, annoying, beautiful, and moving, and I was so glad I made the effort and spent the money to see it, as it was one of those experiences that will not be repeated. The budget was reportedly 1.4 million dollars, and Luminato is the only arts festival in the country that has a large enough budget to be about to put on an event of that scale. This is included for the remaining members of my St. Louis fan club (a lovely group of elderly women who unfortunately are dwindling in numbers), who asked if I could please post more photos of Ginger and Ruby. 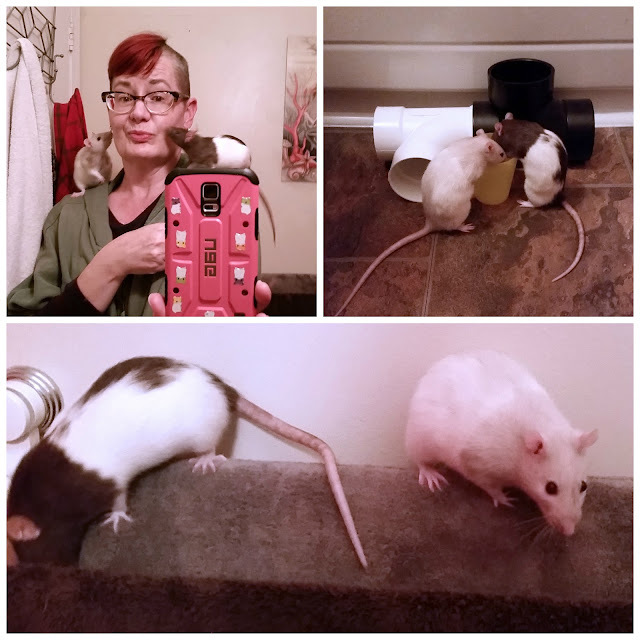 I never thought I could become so attached to a pair of rodents, but I love them dearly, and am fascinated and entertained by their adventures. And for those of you wondering, unfortunately, I am still allergic to them. Hope my Canadian Readers are enjoying their Canada Day Holiday. I just finished reading the "The Boy Who Harnessed The Wind" - if you are looking for an informative, entertaining and inspiring story that reminds you how much we have to be grateful for living in Canada, this fits the bill. Oh, I love the pictures of your little ratlings! I get emails from the St. Louis ladies as well (aren't their emails wonderful?). They are very concerned that I not do lavender hair like Kelly Osborne, lol. I am grateful for many of the same things as you! Here's to our grand country! Oh...double ratty kisses! So cute! I sure hope we don't keep losing all the wonderful things that make Canada great if His Nibs gets in again. It makes me sad and frustrated that my one little vote doesn't count for much. Still, I too am grateful for all my country's good things and am proud and lucky to have been born here. What a lovely patriotic post! As Canadians we are often shy about shouting our patriotic love. I think we are slowly getting over that. The reasons you chose resonate with me as well. After travelling coming home to me always means plenty of wide open green spaces and the possibility to still see wilderness in its habitat. I too am thankful for the things you mention here, especially the critters and being able to travel as an adult woman unchaperoned and the right to decide if I want children. Yay. Your artsy weekend in Toronto sounds like lots of fun. Refuge in a shoe museum? You can't get much better than that. And hurling yourself off a ledge and hoping someone will catch you? That's trust! I love the photo of the three of you together. Very thought-provoking post, my dear. 3 cheers and happy Canada Day! I'm a little late in wishing you a happy Canada Day! Your love for a kind and gentle approach to life is very appealing. Growing up in Minnesota, I am aware of the greatness of your country. A beautiful post about gratitude! Ginger and Ruby are so sweet! The dogwood takes me back to our three years in Vancouver while Bushy did his PhD. I love little rat feet!